It’s every guy’s dream to have a sleek and stylish custom man cave. 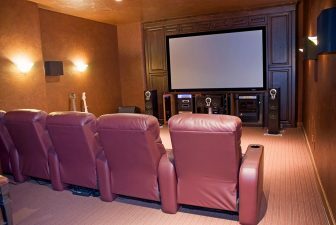 For the ultimate man cave, however, you can’t simply throw a big-screen TV on the wall, buy a recliner, plug in a dorm-sized refrigerator, and call it a day. That’s not a man cave; it’s a man corner. A man cave means completely transforming a space into something that’s 100% your own. Whether you’re a sports aficionado, a video game fan, or a workout buff, a custom man cave can take on any theme or vibe. What Can I Do with My Custom Man Cave? Those who like to wet their whistle may consider installing a bar. Love to watch the game while sipping a brew? How about a sports-bar-themed man cave complete with neon signage and functional beer taps? Mixologists and wine connoisseurs will enjoy having a space to display their bottles, while caffeine chuggers may opt for a coffee bar instead. Man caves are perfect for gaming fanatics of all kinds. Install old-school arcade and pinball games, a billiards table, ping pong, air hockey – the sky’s the limit. If you’re less inclined to spend time in front of a screen and more inclined to get moving, your man cave can take on a workout theme. Install a full gym, a rock climbing wall, or even a boxing ring. Invite the guys over for a few rounds of boxing and beers! Let’s not forget the quiet guys among us. A man cave doesn’t have to be about bright lights and loud sports; it can also be a beautiful study and a peaceful place for reading and reflection. Install floor-to-ceiling bookshelves to display your library. If you build models or do woodworking, your man cave can provide an ideal space to enjoy your hobby. Don’t forget the bathroom! With a custom man cave bathroom, you’ll never have to leave your kingdom when nature calls. You know the TV your wife wouldn’t let you have in the upstairs bathroom? Install it in your man cave bathroom and never miss a second of the big game. If you’re planning to go all-out in your man cave design, you aren’t just dragging in a few pieces of furniture; you’re taking on a serious remodeling project. The first thing to know about building custom man caves is they aren’t a do-it-yourself project. You need to hire a professional. Why is that? Aren’t there YouTube videos that cover everything you need to know? Hardly. An impressive man cave isn’t just cosmetic construction work. It will require the installation of new plumbing, as well as electrical wiring and other things that you want an experienced contractor to do. This will ensure that everything works perfectly from day one. Even more importantly, it will prevent you from dealing with leaks or electrical fires that could result from work done by an amateur. Sorry; just because you rock at fantasy football doesn’t mean that you can rewire the entire basement. Ensure that you’re hiring an experienced contractor who will work with you to get the design you want. A contractor that specializes in remodeling is a real plus, as there are special considerations when it comes to working around an already-existing structure when it comes to supports, wiring, and plumbing. Check out their website and look at photos of their past projects. Have they built other custom man caves? Do you like the quality of work they do? Excellent. Then have them come out and take a look at your space. As they walk through the options with you, your contractor will be able to guide you in the right direction in terms of design and staying within your ideal budget. Once you’re ready to roll, they’ll draw up a contract that specifies things such as the materials and products to be used, payment schedules, and projected finish date. Working with an experienced contractor comes with serious benefits. They’ll provide you with design ideas you hadn’t thought of because they really have seen it all. Their company will do all the work, meaning that you’re free to do other things as your dream man cave gets completed. Finally, it will all be done right, meaning that when you invite the guys over to watch a game, play pool, or enjoy a cold brew, everything will work the way a man cave should.